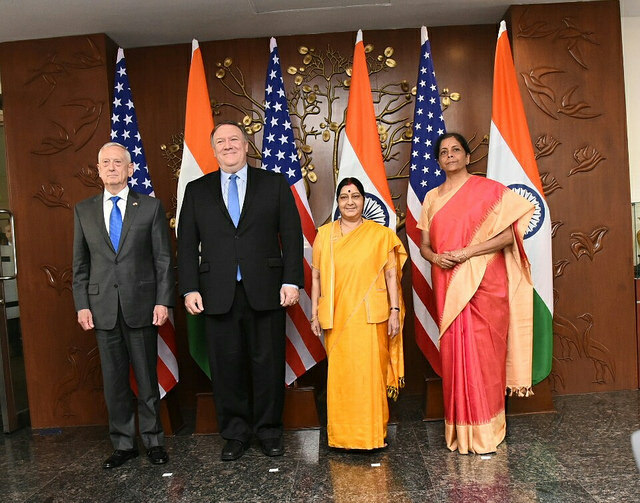 In a statement on the issue, Minister of Defence, Nirmala Sitharaman, said that the agreement would give India access to advanced technologies from the US, which will improve India's defence preparedness. “We are also putting in place an enabling framework for closer cooperation between our defence forces. The signing of the Logistics Exchange Memorandum of Agreement (LEMOA) in 2016 and the Helicopter Operations from Ships Other Than Aircraft Carriers (HOSTAC) earlier this year were important steps in this direction,” she added. In addition to the signed agreement, both nations will “begin negotiations on an Industrial Security Annex (ISA) that will support closer defense industry cooperation and collaboration.” If signed this will integrate a nascent Indian defence industry with a US military-industrial complex. This is where the main problem lies. But aside from the technical, industrial and intelligence aspects of the COMCASA, even on a strategic level, this agreement is nothing short of a disaster. It began in 2002 when the then Indian defence minister George Fernandes signed the General Security of Military Information Agreement (GSOMIA), which began the process of India signing multiple bilateral agreements to gain the trust of the US and form a strategic alliance. The US signed the original Communication and Information Security Memorandum of Agreement (CISMOA), on which COMCASA is based, with many countries including South Korea and Japan putting up a united front on the issue of China - a common threat the US and India. The rapid expansion of the Chinese navy and its ever-increasing ability to challenge the existing power dynamics in the world, especially in the Indo-Pacific region, has brought the two nations together and compelled India to accept what can easily be seen as a one-sided pact. Since the signing, numerous opinions have extolled the benefits. Among them is access to US-patented equipment, which were not shared during previous purchases like C-130. C-17, P8I forcing India to replace them with commercially available alternatives. Unverified perhaps, but apparently, this time around the access to US equipment will be more secure and signing this pack means India is expected to also get advanced weapons for its Apache helicopters. Though, the inability of the US and its allies to share Chinese submarine movement data to India through Link 16 to P8I seems to be the key factor in making this decision. Another one of the original concerns in this matter still stands - namely two-way communication when it is through a technologically superior system owned by one side gives them the upper hand and complete access to the other side’s every move. If tracking Chinese submarines is so crucial, then shouldn’t India be expediting the submarine construction project under Project 75I rather than rushing into signing a pact which gives the US unchecked access to intelligence? By signing these defence technology pacts, India is now blindly following Korea and Japan onto the US chessboard to be wielded at will against China. The US needs the heft of a major nation to contain China and India the only one up to the job. But is this in India’s interest? No. While all concerns about the Chinese are valid, the answer lies in developing a better relationship with them and containing the issues one on one. Since COMCASA enabled equipment is not compatible with existing systems, India will be forced to buy more equipment from the US in a never ending loop and like Japan and South Korea, be forever dependant on them. India is the most prominent country in Indian Ocean and retaining our independence should be the most important strategic objective. The 2+2 dialogues joint statement fails to assure us that becoming dependent on the US is in India’s best interest and will not forever compromise the Indian independent foreign policy. Why has the US has failed to document the waiver of S-400 and petroleum imports from Iran on paper? In matters of such importance, is a verbal assurance enough? Was being compelled to sign COMCASA only to get permission from another nation worth it? How much stock can we put in this newfound alliance when the US is even now employing pressure tactics like blocking the purchase of an S-400 missiles from Russia and making India take sides? The more India refuses to stand up for itself, the worse Sino-Indian relations will get and if under US pressure India-Iran relations sour, India will get trapped between China in East and Iran and Pakistan in West. A nightmare of epic proportions! India must realise that with the exception of China, India and the US do not have any common adversaries and that there are far more countries where India and the US have opposing stands and an eventual showdown is imminent. For every perceived slight, will the US resort to blocking trade and punishing India with sanctions of their own or causing ones from other nations? In the 90’s the US sanctioned India for nuclear blasts but were more than happy to sell nuclear technology few years later. In the same manner, when we examine the whole idea of interoperability, it is farce. The need for NATO forces to be interoperable is necessary but not new, but it is highly unlikely that India and the US will be fighting the same war any time soon. Even in the case of Pakistan, there is far too much going on under the surface for the US to ever come out in support of India. The clearest proof that signing COMCASA was a mistake lies in taking a closer look at the US-Turkey relationship, which is currently in a tailspin despite years of close defence relations. We’re only just getting started and we already have no hope in hell of coming out shining.